Next day we drove three hours from Danang to Hue. Leaving Danang on the country road I started to notice many memorial shrines along the way next to the graves of soldiers who died during the war. Danang suffered the most brutal fighting during the war years. It was near the dividing line between the North and the South (17th parallel) partitioned in 1954. There was lots of bombing westward to the famous Ho Chi Minh Trail. Danang was also used as the main US Air Force base in the sixties. 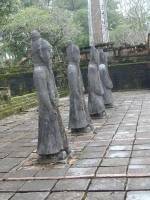 All that remains now are the shrines along the roads to Hue city. Our guide, Miss Ha, explained to us that many people still suffer from the effects of 'agent orange' which has caused genetic damage through several generations. These damaged children are helped to find a living at the countryside workshop doing creative art and craftwork. Their excellent work can be viewed by travellers. We stayed in the 2-3* Ngo Quyen hotel. 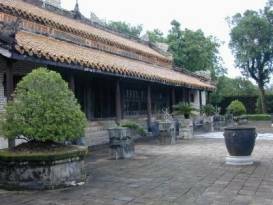 Like the other Vietnamese hotels it is medium size and decorated in clean and comfortable Vietnamese style. A short 10 minutes walk takes you to the famous Perfume River. 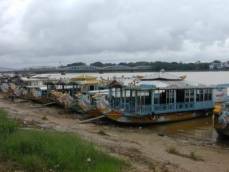 A leisurely stroll along the river and over the two bridges will give you a view of Hue city. 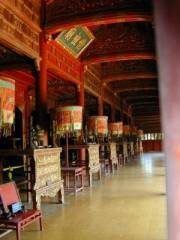 A boat trip on the Perfume River to the Thien Mu pagoda is a must on the itinerary. 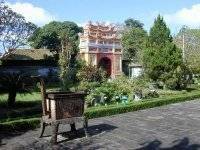 From the impressive gate of the pagoda it is a few steps up to a stunning view over the river. In the courtyard of the pagoda there is a most famous car on display. It was the car that took the monk into the centre of Saigon who then set fire to himself and burned to death in protest over the conflict between Buddhists and the Catholics. The rest of the area is made up of peaceful gardens of trees and flowers. 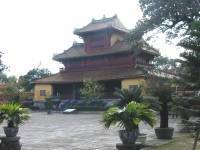 Next we took a detour to the tomb of the Emporer Tu Duc. He built this large mausoleum of eleven pavilions in a parkland of lakes and forestries surrounded by walls. 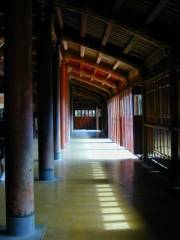 He also built a village for his 104 wives and concubines within the complex. His tomb rests at the back of the Mausoleum opposite to the gate. The queen's tomb and his adopted son's tomb are resting on either side. Because of a childhood illness, Tu Duc had no children even with a total of more than a hundred wives. An interesting and rather haunting place to visit. 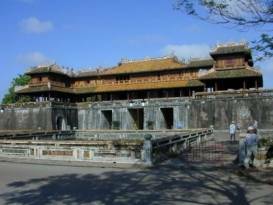 A tour of The Citadel is the highlight of Hue. 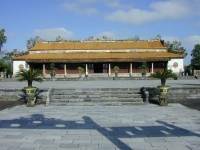 Next day we entered the Ngan gate into the Imperial City, parks, dynastic temples and the royal palaces of the Forbidden Purple City. The fire and the war through out the centuries have destroyed the central part of the Forbidden Purple Palace. 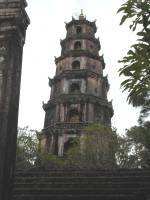 Other parts of the Citadel within its massive 10 kilometre-long perimeter wall have survived intact such as the Flag Tower, The Five Phoenix Watchtowers and the Thai Hoa Palace. Others parts have been restored, such as the Left House and Right House, and others are under restoration such as the Royal Theatre and the Royal Reading Pavilion. Finally we called in at Dong Ba Market in the centre of the city by the river. Here you can buy clothing, china, souvenirs etc. or simply wander through this large and impressive market. We left Hue by air in the afternoon and arrived in Hanoi an hour later. 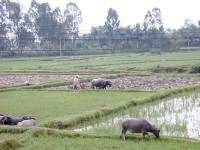 Much of Vietnam is still very rural. Here a rice paddy is ploughed with the aid of the 'poor-mans tractor'. 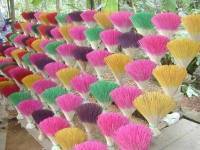 Incense sticks awaiting their coating of incense paste. Tu Duc's mandarins awaiting their orders.